Hydropower is the energy from the flowing water. Flowing water has kinetic energy due to the motion, which is achieved as a result of falling from the heights. Humans have known about the power of flowing water from centuries. 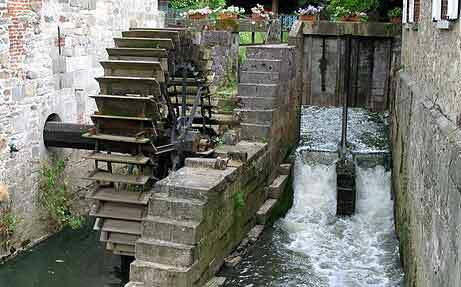 They have been using this power to drive water mills for grinding, rolling and hammering. Hydropower is a type of renewable energy source because the water is not consumed in the process of generating power. Flowing water is provided by the nature in the rivers free of cost, and also renewed by nature itself in the process of evaporation and raining. Scientists have found a way to generate electricity from the flowing water in the late 1800s. Which resulted in the development of power plants known as a hydroelectric power plant to generate electricity from the hydropower. There are various methods to generate electricity from the hydropower. But, the basic principle always remains same. Which is, the flowing water is allowed to fall on the blades of a turbine to generate electricity. A turbine is a machine which converts the fluid energy (in this case, water) into mechanical energy. Turbine is connected to a generator through a shaft or a gear. 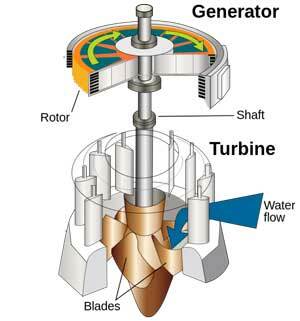 When blades of the turbine rotate due to the flow of water, they also rotate the generator through the shaft. As a result, electricity is generated. It the easiest way to make the electricity from the water of the river. In this method river’s natural flow is directly used to turn the blades of the turbine. This method provides a lot of advantages over other two methods. The main advantage is its simplicity, which reduces the cost of the whole system. There no need to make any dam, which reduces the impact on the surrounding regions. But, this method is only useful for the rivers that are continuous and flowing all the year. In this method, the water coming from the river is stored in a dam. Then, this stored water is released from the dam at a height, which falls on the blades of a turbine and forces them to rotate to drive generators. Using this method also provides the control over the flow of water, and continuous electricity can be produced. World’s largest dam “Three Gorges Dam” is located in china. Its electricity generating capacity is 22,500 MW. The disadvantage of this method is the cost of the dam, which is very high. This method is useful where we need both controls over the flow of water and generation of electricity. This is the same method as describes above, but with the addition of the pumping system. Pumping system pumps the water back to the dam or any other reservoir. The pumping is done when the consumer side electricity consumption is less. Pumping system may get the electricity from other renewable energy sources (e.g. solar or wind) or from the power grid when there is excessive electricity. The benefit of doing this is that when power demands are high then, this extra water can be released to produce more electricity. This is a clean source of energy, so it does not pollute the atmosphere. This is a renewable source, means it won’t run out. Hydroelectric power plants can also be used to provide backup power when electricity demands increase very high. Hydropower plant dams also provide facilities other than the production of electricity. These facilities are flood control and saving of water for irrigation purpose. The cost of making a dam is very high. Dam and turbines can harm the fishes living in the water. 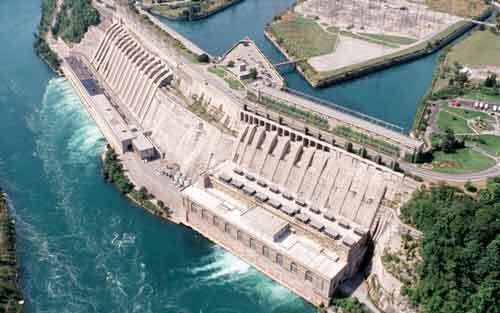 Hydroelectric power plants can be built only at the places with sufficient flowing water. Abdul Wahab, "Hydropower," in Science4Fun, April 13, 2019, http://science4fun.info/hydropower/.